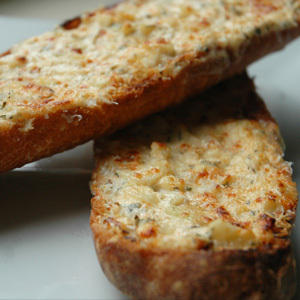 Caramelised Onion Garlic Bread is different from the usual Garlic Bread as caramelised onion is added to the dough before baking. It is extremely easy to make and can be served with pizzas, spaghetti and pastas. Add the pizza bread flour, melted butter, sugar and salt to a mixing bowl first. Now pour the 320 ml warm water to the bowl and stir the ingredients firmly. Make sure you add the water after short intervals. The right way would be to add some water and stir the mixture. Keep adding water until the desired results are achieved. The result of adding water to the flour mixture would show in the form of a dough. Place the dough in a small bowl and cover it with a plastic foil for some time. In a separate bowl, chop the onion into small pieces. Now add these chopped onions to a preheated saucepan and wait for them to turn golden in colour. When they reach the desired colour or when they are caramelised, chop the ginger and add to the saucepan. Cook for two or three minutes, and remove the pan to add the onions and garlic to a bowl. Now turn to the dough which must have increased in its size. Press the dough to get rid of the gas and add the caramelised onions and garlic to it. You can add the caramelised onions and garlic in any way you like. The best way is to add them equally to the outer layer of the dough. When you are done with adding the onions and garlic, place the piece of dough in a baking pan and leave it for a good 30 minutes. After waiting for 30 minutes, place the baking pan in a preheated oven and bake the bread for 20 -25 minutes at a temperature of 350°F. When the crust starts to turn golden brown, remove the bread from the oven and cut it into small slices. Serve immediately for better taste.